Just graduating — or recently graduated — and worried that all the time, money, and effort you put into college may never bear fruit with a really good job? Tired of living with your parents and concerned you see no end in sight? Just plain unfocused and don’t know where to turn? Take a breath! 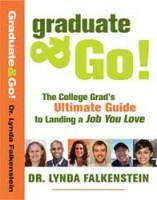 Graduate & Go! was written just for you and now you can get it in eBook version absolutely FREE. That’s right. No hooks. No hidden anything. Just a gift to you from those of us here at Niche World Headquarters. To get started, just complete and submit the form below! Match the values above to submit your request.